Happy publication day to Emily Carpenter’s fantastic summer psychological thriller, THE WEIGHT OF LIES (6/6/17)! I’m thrilled to share a Q&A with Emily about her addictive, engaging suspense novel on the blog today. In this post you'll find: plot summary, links to my review of the book and the book's Amazon info, and of course, my Q&A with Emily! THE WEIGHT OF LIES was an instant-hit for me. This book is easy to binge-read, engaging, and just the right amount of creepy—in short, it’s my ideal summer beach read. 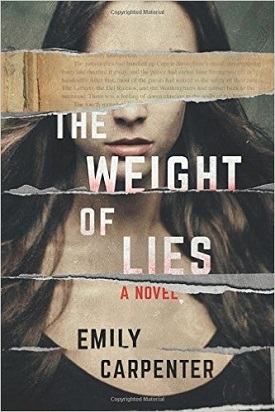 In case you missed it, you can read my review of THE WEIGHT OF LIES here. 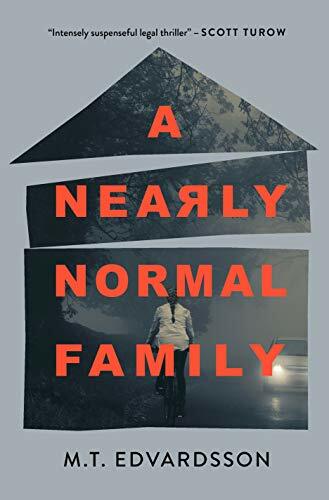 I highly recommend this book for crime readers looking to be swept up in an addictive, fast-paced psychological thriller that pays homage to cult-classic horror. Many thanks to Emily for taking the time to answer my questions about this book, and to her publicist Sabrina for facilitating this Q&A! Crime by the Book: What inspired you to write this story? CBTB: If you could choose 3 adjectives to describe THE WEIGHT OF LIES, which adjectives would you pick? EC: Southern Gothic, spooky, twisty. CBTB: You currently live in Georgia, the state that provides the backdrop for the majority of this book’s action. How much of Bonny Island is inspired by real places? EC: I’ve vacationed for years (courtesy of my wonderful in-laws) on Sea Island, which is one of the larger of the Golden Isles, and also have spent time on St. Simons Island and St. Catherine Island, so I basically combined characteristics of all these islands – plus Cumberland and Little St. Simons – into the fictional Bonny. The cool thing about the barrier islands is some of them are privately owned, some have homes on them, some are protected areas. They all have this incredible wildlife, a combination of marsh, wilderness, and shoreline. Not to mention fascinating histories. CBTB: My favorite element of THE WEIGHT OF LIES is its cult-classic horror nostalgia, from the references to horror classics to the cinematic quality of its final showdown. Are you personally a horror fan? If so, what are some of your favorite horror films and/or books? EC: I’m definitely a fan of old, classic horror. I loved Dracula and Frankenstein and my sons keep trying to convince me to read Lovecraft. I haven’t delved into that whole can of worms yet. Stephen King and Shirley Jackson are two of my all-time favorite authors. To be honest, I’m not really schooled in modern horror, but a few years back, I did read Let the Right One In – a Swedish vampire book that was terrifying. Oh my gosh. There’s this scene with these cats. I love cats, I have two, but they can be really chilling little suckers. Carrie has to be my number one. It’s just so heart-wrenching, the story of a young girl who is basically all alone in the world, misunderstood and reviled, but she possesses this devastating gift that could just obliterate everything. The story is not about the gross-out factor or the fear, really. It’s a story of a girl becoming a woman, and how terrifying that can be. (Well, that’s my interpretation, anyway.) In terms of films, I love The Shining, the first Halloween, the original Carrie (of course), anything Alfred Hitchcock, The Witch, The Babadook, Let the Right One In. CBTB: I loved the world you created surrounding Kitten, from its “chapter excerpts” to its whole legion of fans! When writing a “book within a book,” how do you even approach that? Did the idea for Kitten come first, and then you had to fit it into a larger story? Or did you develop Kitten alongside the rest of the story? EC: I was really excited about writing this complete other book in the voice of one of my characters. It just felt like such fun to me! I knew from the start that I was going to have the Kitten excerpts in the novel, moving along the action, deepening the mystery, and being a sort of Greek chorus to what was happening in present day to Meg on Bonny Island. So I wrote most of the chapters right along with the rest of the book. I didn’t start with inserting the parts of the novel between every chapter, that came after I realized that Kitten seemed to be really working in terms of the larger narrative. Once I got to the end of drafting the book, I wrote several more chapters – or split up some of them – and slot them into place. Also, you know, some of the original chapters I had to chuck - basically chapters with Kitten doing random nefarious things. Since they didn’t point toward the main mystery, they had to go, even though I liked the idea of leaving out chunks of information, then referring to it later in an oblique way. Well, I cut most of them. There’s one thing that Kitten does off-stage that kicks off some dire consequences. Writing about the Kitty Cult was like being in Disney World. That part was incredibly fun, learning all about fan culture, poring over these incredibly detailed, obsessive Reddit threads. I loved the whole idea of how a fandom over a book/movie/etc. could morph from the 70s to now, especially with the internet coming into play. After I get the idea, I have to kind of let it rise, like dough. I never know how long that’s going to take, but I just let it take what it takes. I mull over the idea, flesh it out, think of characters in terms of backgrounds and motivations and why they would be in this situation. Why it would matter to the reader. I also think about exciting set pieces (incidents) that could fit in the story – events that could inspire awe or be really cinematic. I don’t write any of this stuff down, and I usually don’t talk about it. I just keep it all tucked away in secret and then, all of a sudden, one day the timer dings and dough is ready. That’s when I outline. I use an old Syd Field screenwriting paradigm to sketch out roughly five to seven tent pole moments of the story, and then I go. Time to write and see what I have. CBTB: Last but not least: what are you currently reading? EC: I’m in the middle of several books: The Marriage Lie by Kimberly Belle. It’s really good. She’s an amazing writer and storyteller. Behind Her Eyes and The Woman in Cabin 10, both of which are fantastic. I’m actually a pretty slow reader, so it takes me a minute.